Dandelions are an under appreciated beauty in our society. Their strong, extensive root system and ability to reproduce in just about any environment make them a menace to gardeners and farmers. For that reason, dandelions are often perceived as a menace, and we fail to admire the symbolic messages the resourceful little flower conveys. Even at first glance, these dandelion flowers can imprint messages in the form of its colors. The dandelion has a special ability to communicate different messages in different seasons. Sometimes the flower is a courageous yellow, and sometimes the flower is a downy white. These beautiful colors have different symbolism and meanings associated with them, and we can look to them to better understand the significance of the dandelion. Yellow dandelion radiates bright and fearless energy; it’s a color often linked to bravery, excitement, autonomy, and strength. Yellow is a color that demands to be seen. Similarly, these messages are bold. Yellow is also thought to be linked to the spirit and personal growth. Therefore, the dandelion challenges you be bold without losing your sense of self. The color white takes a more introspective approach. Because white contains all other colors, it is often thought to be representative of wisdom. White compels us to think of clarity and purity. In the case of the dandelion, this could be seen as a clear sense of purpose. This is an important message to consider—what is your purpose, and how can you fulfill it? Seek to understand your true worth completely, and do not shy away from it. Though the dandelion is not a flower often adored by onlookers, it treats us kindly. In fact, this flower is incredibly useful to our species. Both dandelion leaves and roots can be used to promote good health and wellness. They are used in the form of home remedies in teas, tonics, and creams to fight a number of ailments. It is a plant rich in vitamins, potassium, zinc, protein, and calcium (to name a few) and be helpful in fighting anemia, eczema, and other serious conditions. 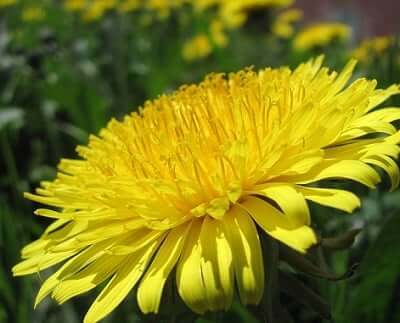 Ingesting dandelions can be detoxifying to the liver and allow you to enter a higher state of physical health. This begs the questions, what areas in your life are in need of cleansing? Identify the negativity around you and rid yourself of it. By doing so, you can elevate yourself to a happier state. The dandelion is a good reminder to start fresh occasionally and rid yourself of past baggage. If this feels like a daunting task, meditate on the dandelion to find your comfort. This flower is built to survive even the most adverse conditions. They sink their roots deep into the earth and endure. When faced with pesticides, dandelions often come back twice as difficult to remove. Finally, the dandelion is particularly adept at spreading its seeds to promote reproduction. It’s an amazingly effective little plant. When you think about the dandelion and how it carries itself far and wide, consider your own impact. What seeds are you sowing in your life? What impact are you having on those around you? Are they positive or negative? When you impart something of yourself on to the world, be sure that it is something you feel proudly of. Tend to your inner wisdom and cultivate the best you. Simply put, the dandelion flower symbol teaches us to be the best and most empowered version of ourselves.